Christ Centered and Law-Gospel focused exposition of Scripture. Confesional and liturgical in worship practice. Study Holy Scripture with a Law and Gospel emphasis. Promote an understanding of Holy Scripture as presented in Luther's Small Catechism. Facilitate the application of the Catechism in daily life through prayer, family and personal devotions. In need of mercy, compassion, and spiritual care. In physical and material need. In witness of Christ's love. Crosses - Jesus" death and pain reminds us that faith in Jesus is what saves us. 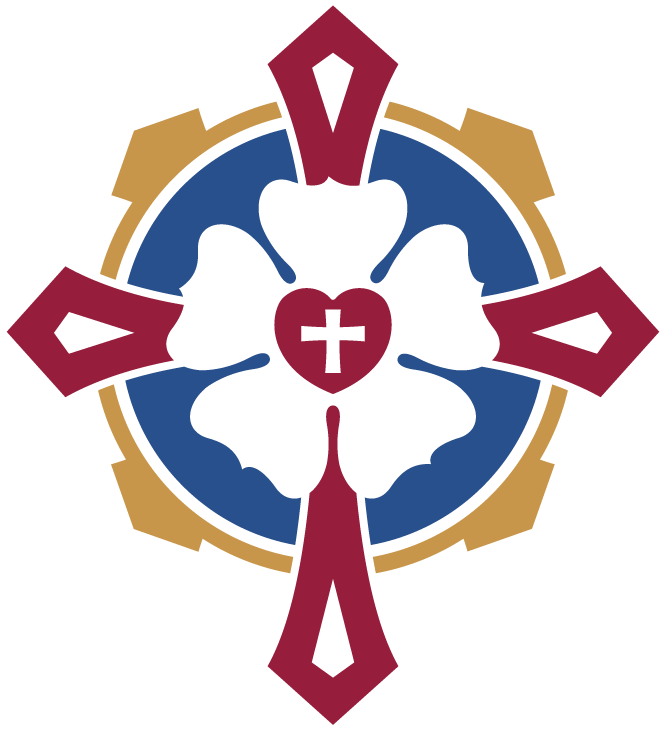 Luther's Rose - Faith in Jesus brings true joy, consolation and peace, not worldly joy and peace. Blue background - the hope for coming joys of heaven though not yet revealed. Gold crown/rim - symbolizing unending joys of heaven more precious than another other treasure. Cross in heart and points on cross - Outreach.